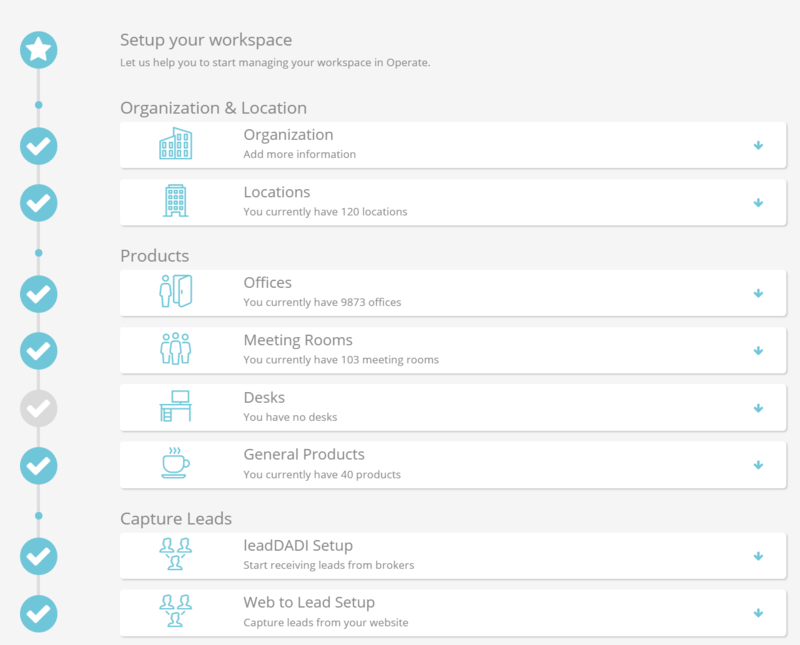 Operate is a complete software solution that allows you to efficiently manage your workspace: from leads to customer communication, to lease or membership agreements to short term bookings and more. What can you do with Operate? Charge and invoice customers for products and services. Manage products, services and inventory items. Manage customer accounts and contacts. Sell workspace through long term licence agreements or adhoc bookings. Create your own community Portal where members can interact, book space, sign up for events or pay invoices. (Not available if you have a trial account). A list of common terms used within Operate and their definition is available in the Glossary. Operate makes it easier to get started as an Administrator by providing you with a clear checklist you can follow in order to set up all of the essential elements of the system. Whether you are an Admin or not, you will have access to a number of features you can use within Operate. Please note: If you are not an admin and any of the below features is missing from your account, please contact a colleague who manages Operate within your company to clarify whether you should have access to it. Below is a list of features, broken down by the way you might want to use them. Each feature in the list contains links to help guides that will provide more information. Customizing your User Profile - This is how you can enter your personal information within Operate. Customizing your Email Signature - Your Email signature will appear in all of your email communication, as long as it is done via Operate. A 'record' is any piece of information you enter within the system or that is automatically generated. Records may include, but are not limited to: Accounts, Contacts, Invoices, Reports, etc. Overview and how to use. You can make Operate your own by customizing many of its modules. Below are some of the essential customization features you may want to use. Our knowledgebase section on Customization contains all of our help guides on the topic. Operate comes with a variety of marketing oriented tools, to enable you to create prospect and customer relationships faster and easier. Convert Leads into Opportunities when when you gain a prospect. Use Tours to manage visits your prospects make within your buildings. Use Mailing Lists and Email Campaigns to communicate to your contacts, leads, prospects, brokers or customers. Read an Overview of Accounts in Operate. Broker - A third party company that sends leads your way. Prospect - Any converted lead that your decide to turn into a Prospect Account. This is essentially a potential customer with whom you are working towards a possible deal. Account - This is a customer who has already purchased for you. Best Practice: In Operate, a Contact should belong to an Account. Everything you sell can be added to Operate as a Product. The Product module also includes any Services you might provide to your customers; which are set up as a product type. Products are classified in the system by type and by group. Product Types represent just that: the type of product you are selling. There are several default types, to which you can add your own. Find out more in our dedicated knowledgebase article on product types. Product Groups are a way to categorize your products in order to determine their availability throughout different modules of the system. Read mode about Product Groups. Both of these attributes are mandatory for all product records. Products can be invoiced for using Operate's invoicing features (discussed below). For example, if you would want to add 'Coffee' as a product to your Operate, you could add it under the general 'Product' type and include it into a 'Catering' group. You can communicate in Operate either via Email or SMS. The available email features are listed and explained here. These features are available throughout many modules of the platform so that you can communicate to leads, prospects (through the Opportunities and Accounts modules), with customers or brokers (directly from their Account page) or with individual contacts. The Mailing List and Email Campaign features allow you to send mass email messages and communicate to multiple contacts in one go. To learn more about SMS communication, please read the guide on how to use SMS in Operate. SMS can be sent from most records containing a phone number field (e.g. a lead, contact or account). Both emails and SMS messages can be used in automated tasks performed through Workflows (e,g, to send notifications or any other communication you want to automate). When using either email or SMS, you can add Merge Fields that retrieve customer specific information from the system and make it easier for you to automate communication using a predefined template. Templates are available for both Email and SMS. There are two important ways to sell your space through Operate: Through Bookings or Licences. If you want to sell a space for a short, limited amount of time, you can do so using the Operate Calendar, where you can book space on an hourly or per person/per day basis. The Calendar can be successfully used to book meeting rooms, desks or even parking spaces. It's a very useful feature if you sell shared coworking spaces. You can book one time or on a recurring basis, and you can also add multiple bookings for the same customer in one go. This module is useful for situations when you rent desks or office spaces on a long term, under a lease / licence / membership agreement. The module that manages this is Member > Licences. Read more in our overview guide on Licences. As part of a Licence, you can sell space, products and services, to residential, virtual or coworking customers. Read more about Licences in our dedicated knowledgebase section and take a look at the most common issues and best practices related to Licences. Batch Sheets - These are a way to add charges into the system when you sell the same group product/service to multiple customers and makes it all easier due to the fact that you do not have to add each customer charge separately. When invoicing, each charge will automatically go to their respective customer's invoice. Metered Batch Sheets - These are batch sheets that allow you to add meter readings and are great to use when you need to charge customers for metered services such as utilities. Charge Sheets - When you need to charge a customer for a product or service, you can use Charge Sheets, which will bill one customer for one product or service. Point of Sale (PoS) - The PoS is a touch screen friendly interface that allows you to charge customers for products and services. It's easy to use when you are on the go or if you have someone who handles product sales within your workspace. The PoS produces charge sheets which in turn are added to the invoice at the time when you bill the customer. Invoices are created either manually or automatically (as part of the Bill Run process at the end of the month). They include all of the charges that have been applied to a customer, for all of their purchases. Invoices are first created as drafts so that they can be modified. Once the invoice is final, it is approved and issued to the customer. Credit Notes generate credit to a customer's account and are typically used when needing to restore an amount to the customer's balance, because of a billing error or overcharge. Add Payments made by your customers. Use Journals to debit or credit a customer's balance. Generate Statements to view a customer's overall AR situation. Refund charges other than deposits. At the end of each month, you would likely need to gather all of your charges and send your customers invoices. This is managed through the Bill Run Process in Operate, which does it automatically, for all or selected customers, depending on your choice. Operate is not an accounting software; however, it allows you to take your data and export it into your preferred application. There is a general financial export which gives you a downloadable .csv file to import into any accounting software; but there are also specialized integrations with systems such as Quickbooks, Sage, Xero, etc. Read the complete list to see if yours is there or see the knowledgebase section on financial integrations to read our existing export guides. All of the data that you work with in Operate is gathered into a comprehensive database that you can use later on for reporting purposes. Operate provides a series of pre-configured reports, as well as an easy to use builder with which you can create your own, using the available data you have within the system. Read our Reports Overview guide to learn more. See our list of pre-configured reports and learn how to run them. The custom reports you can build can be diverse and as simple or as complex as you want them to be. Here is how to create your own reports. We have an entire knowledgebase section dedicated to Reports, which will provide you with further information on the types of reports you can run, as well as the more advanced features you have available. The Tasks module is an easy way to manage your to do-s right inside Operate. Read the Tasks help guide to learn more. When there are repetitive tasks that you would rather not have to do, you can delegate to Operate and rest assured that they will get done. These tasks could range from notifying staff that they have a new scheduled tour with a prospect, to automatically replying to lead enquiries, creating tasks for your staff (e.g. when a tour is scheduled, create a task to call the prospect) to updating fields within the system. Workflows come with a variety of filters and triggers you can use to create both simple and complex automations. Read our overview of the Workflows module or see the knowledgebase section for a list of available help guides. The Organization is linked to Locations, and all modules that depend on Locations. Each Location has specific Client Types assigned. By selecting a particular one, the Location is being linked to the Organization for which the Client Type has been set up. 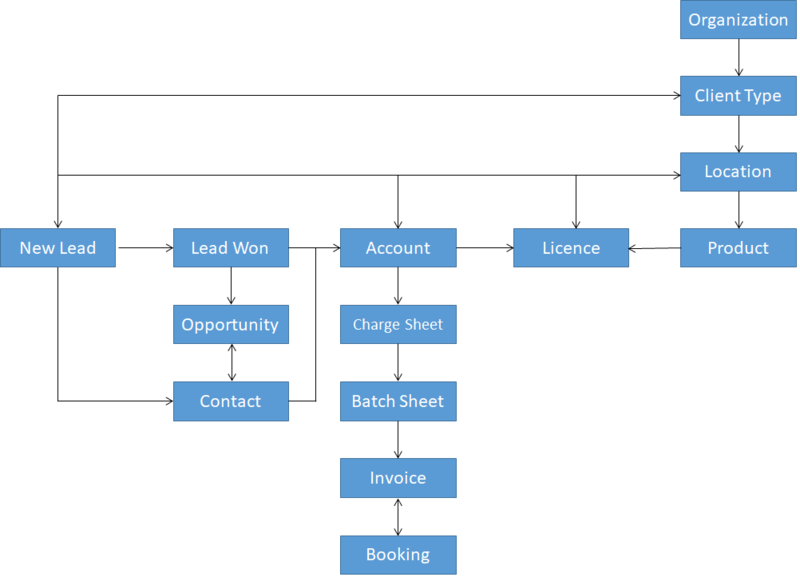 Leads, Opportunities, Accounts, Contacts, Licences, Products, Bookings, Charge / Batch sheets and Invoices depend on a Location. A new Lead becomes an Opportunity when converted. Along with the Lead, a new Contact is automatically created and associated to the Lead and any future records created from its conversion (Opportunity or Account). If selected, a new Account is created when converting the Lead into an Opportunity. All financial transactions and Invoices; as well as Calendar Bookings and Licences depend on an Account.